One of the most important daily Human Body needs is to keep your Teeth and Gums clean and a fresh breath. Your mouth and its organs – Tongue, Teeth and Gums – come in to contact and are heavily involved in whatever you happen to put in to your mouth. It is their responsibility to grind, cut, tear, shred and chew every that must pass through your mouth to get absorbed by your body. Why do we have four different types of teeth, all specifically placed for the maximum efficiency of Chewing? Food that is not chewed well cannot accept the saliva and enzymes that should be mixed in with the food as is so vital, and will have a negative effect on every other aspect of the digestive system. There are 32 teeth of four different types in the mouth of an adult, all strategically placed for the right reasons and maximum chewing efficiency. 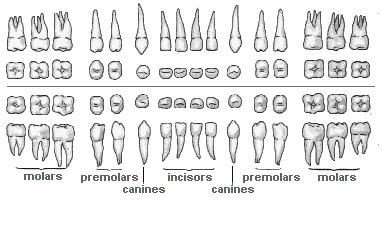 The 8 incisors are the very front teeth with rather flat surfaces, a straight sharp horizontal edge for cutting and biting the food and one long, single, conical root. The 4 canine teeth are very strong, pointed corner teeth for tearing and shredding, placed laterally to each lateral incisor. They are larger and stronger than the incisors. The upper canine teeth are sometimes called eyeteeth. The 8 premolars, used for the chewing of the food, are placed lateral to and behind the canine teeth, with a flat upper surface and 1-2 roots. The 12 molars are the back teeth. Molars are the largest of the permanent teeth, used for the final chewing and grinding of the food before swallowing. The very back molars are also known as wisdom teeth. So in order to help reduce plaque and tooth decay, using a toothbrush twice or more times a day is very important. Is What You Eat Important? What you eat and drink has a major affect on the cleanliness of your mouth. The more natural, wholesome and unprocessed, low sugar content and primarily organic the food, the better it will be for the whole digestive system, starting with the care and maintenance of your teeth and gums. What about products containing Fluoride? There is an abundance of evidence showing fluoride to be highly toxic. If not, why do fluoride-containing products carry warning labels like “Do not swallow”? Fluoride is NOT an essential nutrient and in the opinion of experts in the field, it does NOT prevent tooth decay. There are plenty of studies showing the dangers of ingesting fluoride, both from dental products and fluoridated water. It is well worth consulting with your Dentist and / or Hygienist about how best to brush your teeth, floss and program for good, necessary maintenance. The clean, healthy, pleasant breath results provides for a very positive effect on your overall health, with long term benefits that are hard to beat.